We did the unthinkable this year. We bought a cut Christmas tree instead of a living one. Cons: No roots. No planting outside. Pros: $60–$90 cheaper than a comparable living tree. It fit in my car, more or less. About 100 lbs lighter than it would have been attached to a pot full of soil. Fills the whole house with the fresh scent of sap oozing out of its poor severed stump. And after Christmas — firewood! Okay, so I’m not quite comfortable with the whole dead-tree thing. But I think this year it was a good choice for us. The tree-decorating custom in our house is that I put the lights on while the kids are at school, and then they get to hang the ornaments on it when they get home. I mention this to explain why our tree looks as though it was decorated by children. It was, and I love it that way. 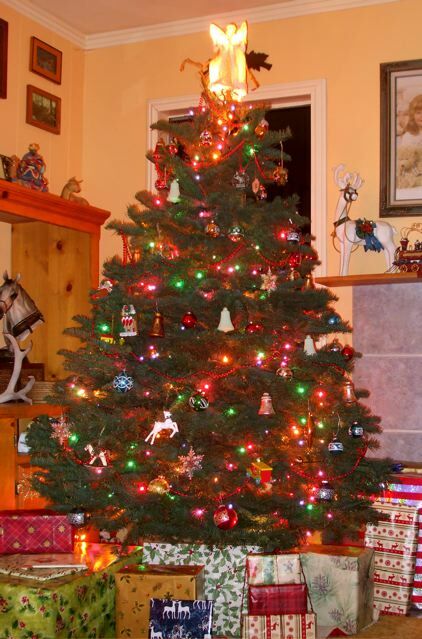 Is there any other way to have the tree look? I mean really Deb. Lol! I see some people’s trees and it looks like they hired a professional to create the look. But I’ll take a child-decorated tree over one of those any old day! I have some spots over done and some a bit bare…but it was done with glee! I just added bows to those bits to fill in. 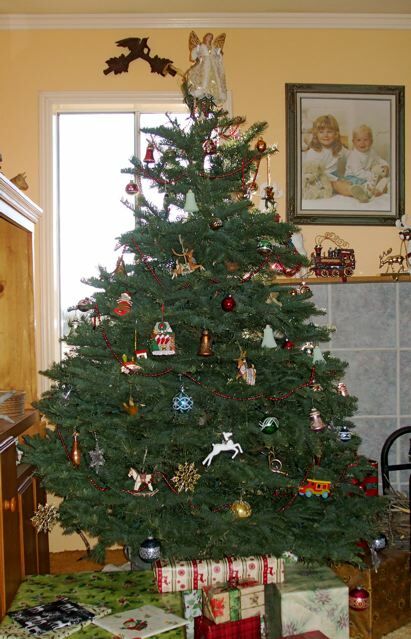 Oddly enough…my tree seems to re-arrange the ornaments all by itself. Seems it’s partial to the ones that the Duck picked out. They are all up front now! Clearly you have a tree of unusually fine taste and discernment!